The 35th Infantry Regiment Association salutes our fallen brother, CPL Jessy G. Pollard, who died in the service of his country on August 22nd, 2007 in Multaka, Iraq. The cause of death was listed as Helicopter Crash. At the time of his death Jessy was 22 years of age. He was from Springfield, Missouri. Army Spc. Jessy G. Pollard, 22, of Springfield, Mo. Spc. Pollard was assigned to the 2nd Battalion, 35th Infantry Regiment, 3rd Infantry Brigade Combat Team, 25th Infantry Division, Schofield Barracks, Hawaii; died Aug. 22, 2007 in Multaka, Iraq, of injuries suffered when his helicopter crashed. Also killed were Capt. Corry P. Tyler, Chief Warrant Officer 2 Paul J. Flynn, Sgt. Matthew L. Tallman, Spc. Rickey L. Bell, Capt. Derek A. Dobogai, Staff Sgt. Jason L. Paton, Sgt. Garrett I. McLead, Cpl. Jeremy P. Bouffard, Cpl. Phillip J. Brodnick, Cpl. Joshua S. Harmon, Cpl. Nathan C. Hubbard, Spc. Michael A. Hook and Spc. Tyler R. Seideman. Family members confirmed that Springfield native Jessy Pollard, 21, died in the crash. He was fighting for our American freedoms that we enjoy, said Alan Dewitt, Pollards stepfather in Ozark. After high school he really got into wanting to do that. He prayed about it a lot before he joined. Dewitt said his stepson was an Army Ranger aboard the UH-60 Black Hawk, one of two helicopters flying a nighttime mission. Military officials said initial indications showed the helicopter experienced a mechanical problem and was not brought down by hostile fire. The cause of the crash was still under investigation. It was the deadliest crash since January 2005. The four crew members and 10 passengers who perished were assigned to Task Force Lightning, the military said. Pollards aunt, Sandy Kaufman of Springfield, recalled her nephew as a very tall, good-looking young man who was eager to pursue a career in the military. He was a paratrooper who jumped out of planes and stuff, she recalled. He said it was an adrenaline rush. Kaufman said Pollard didn't know what direction his life should take until he joined the military. He just really embraced it, she said. He'd come home and regale us with stories about jumping out of planes at night. In July, Pollard returned to Ozark for a two-week visit before heading back to Iraq. "We hadn't seen him in six months so it was good to have him back," Dewitt said. "He was doing what he wanted to do." Pollard is survived by his mother, Patti Jo Dewitt and sister Whitney Pollard, 19, among others. Pollard played football and basketball at Glendale. Amanda Orchard, who played softball with Pollards sister at Glendale, remembered Pollard as a real outgoing, fun guy. I had classes with him, we talked, she said. He was a big, tall guy, real athletic. Orchard said she was proud that a Glendale graduate chose to serve in the military. "I think that's awesome, if that's what they have the heart to do," she said. Lesley Noe, who graduated with Pollard, remembered his desire to do more than was asked. "We both really liked Romeo and Juliet, and in one of our classes we had to memorize 15 lines," she said. "We decided to memorize 150 lines. He was really hard-working and always wanted to go above and beyond what you had to do." Glendale Principal Gary Prouty said the high school will have a moment of silence Thursday the first day of classes to honor Pollards memory. Army Spc. 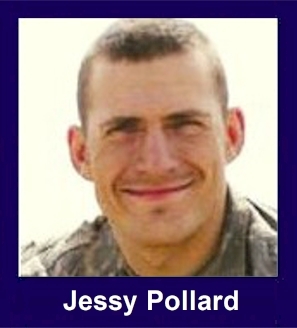 Jessy G. Pollard was killed in action on 8/22/07.